Summary: Payne’s Farm and New Hope Church were the first and heaviest clashes of the Mine Run Campaign. In late November 1863, Meade attempted to steal a march through the Wilderness and strike the right flank of the Confederate army south of the Rapidan River. Maj. Gen. Jubal A. Early in command of Ewell's Corps marched east on the Orange Turnpike to meet the advance of William French’s III Corps near Payne’s Farm. Carr’s division (US) attacked twice. Johnson’s division (CS) counterattacked but was scattered by heavy fire and broken terrain. After dark, Lee withdrew to prepared field fortifications along Mine Run. The next day the Union army closed on the Confederate position. Skirmishing was heavy, but a major attack did not materialize. Meade concluded that the Confederate line was too strong to attack and retired during the night of December 1-2, ending the winter campaign. Background: After the Battle of Gettysburg in July, Confederate Gen. Robert E. Lee and his command retreated back across the Potomac River into Virginia. Union commander Maj. Gen. George G. Meade was widely criticized for failing to pursue aggressively and defeat Lee's army. Meade planned new offensives in Virginia for the fall. His first attempt was a series of inconclusive duels and maneuvers in October and November known as the Bristoe Campaign. Battle: Speed had escaped Meade, who was furious with French, and this allowed Lee time to react. Lee ordered Maj. Gen. Jubal A. Early, in temporary command of Ewell's Second Corps, to march east on the Orange Turnpike to meet French's advance near Payne's Farm. Brig. Gen. Joseph B. Carr's division of French's corps attacked twice. 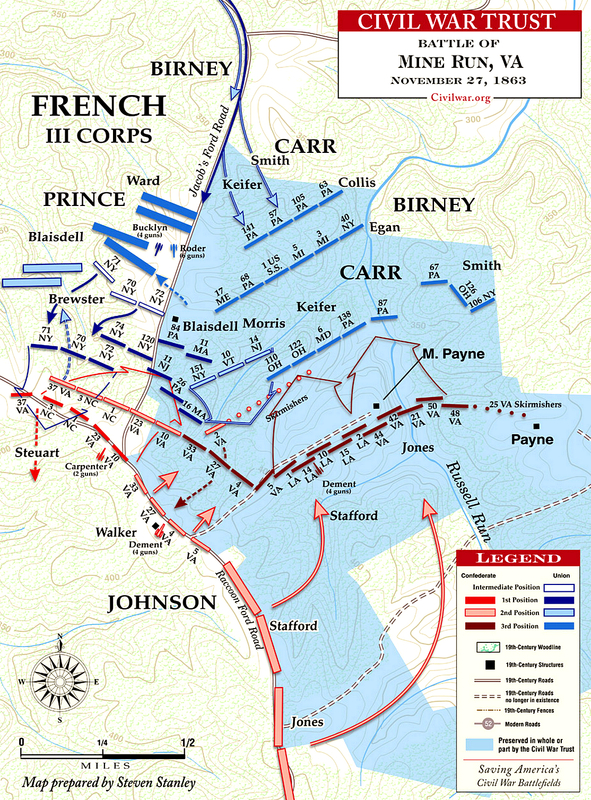 Maj. Gen. Edward "Allegheny" Johnson's division counterattacked, but was scattered by heavy fire and broken terrain. Aftermath: The Army of the Potomac went into winter quarters at Brandy Station, Virginia. Mine Run had been Meade's final opportunity to plan a strategic offensive prior to the arrival of Ulysses S. Grant as general-in-chief the following spring. Lee also regretted the inconclusive results. He was quoted as saying, "I am too old to command this army. We never should have permitted those people to get away." Confederate hopes of repeating their Chancellorsville triumph had been dashed. Sources: Civil War Trust, civilwar.org; Library of Congress; Eicher, David J. The Longest Night: A Military History of the Civil War. New York: Simon & Schuster, 2001. ISBN 0-684-84944-5; Graham, Martin F., and George F. Skoch. 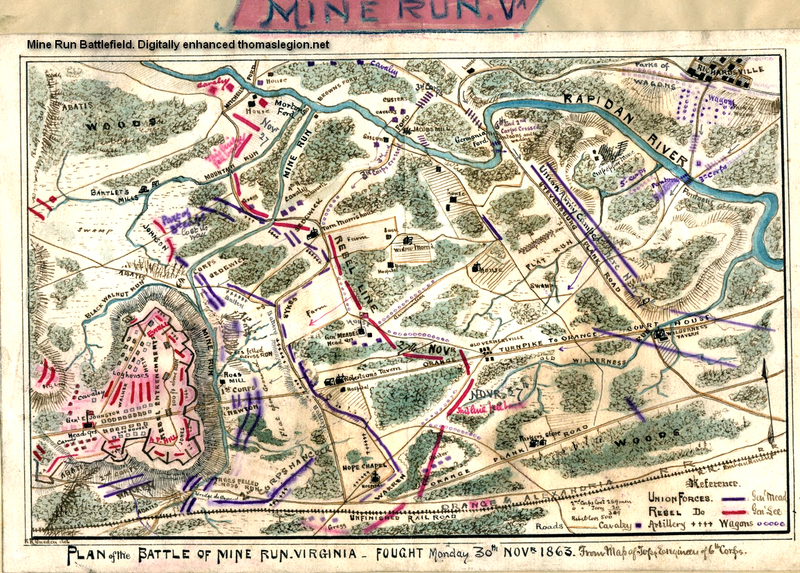 Mine Run: A Campaign of Lost Opportunities, October 21, 1863–May 1, 1864. Lynchburg, VA: H. E. Howard, 1987. ISBN 978-0-930919-48-1; Esposito, Vincent J. West Point Atlas of American Wars. New York: Frederick A. Praeger, 1959. OCLC 5890637; Salmon, John S. The Official Virginia Civil War Battlefield Guide. Mechanicsburg, PA: Stackpole Books, 2001. ISBN 0-8117-2868-4.